Child's Garden of Verses Robert Louis Stevenson; online at Poetry Lovers, and PG with illustrations by Jessie Willcox Smith or Myrtle Sheldon. As an optional alternative to any term in Years 4-6, you might enjoy these 59 poems. Classic seasonal poems for Thanksgiving, Christmas, and New Year's. To transfer AO's poetry collections to your device's Kindle app for free: Install Push to Kindle. Dr. Rampey's Guide to Reading Poetry may also be helpful. Audio: Librivox.org has a plethora of poems read by various readers; notable dramatic readers so far: Glen Hallstrom ("Smokestack Jones"), Kristin Hughes, Martin Clifton; David Barnes, and "Chip" are also good. AO has a collection of poems for Thanksgiving and Christmas! 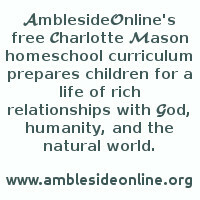 If you prefer free, you can download a text file of AmblesideOnline's Poetry Anthology that includes 208 classic poems for the whole family. Click the link to view, or right-click and choose the "Save Target . . ." to save to your hard drive and format/print to your preferred specifications in your own word processing program. This does not include any of the poems in the Year 1 collection. Cannot: and what it is, who knows? Good poetry should use words that are exact and descriptive with no forced rhymes, but instead words and lines trip along with the lightness of children jumping rope. Clumsy doggerel - in contrast to the verses of Lear, Richards and Milne - is heavy footed and its words and rhymes have no sparkle. Good poetry gives freshness to ideas - whether common ones or new ones. A good poem should result in laughter, or dreams to ponder, or a sharpened awareness of life. The chief appeal of poetry is to the ear, the emotions and the imagination. A poem should be heard, not read. It may take a few times of hearing a poem to determine whether you like it. Some poems practically sing and stick in the mind. Lyric poetry - "poems so lovely in sound that they will speak to the inner ear and to the spirit and imagination of the child" - can be enjoyable because of the mere flow of words themselves, even if the child doesn't totally understand the vocabulary. "Children are caught by the charm of words and phrases, and without knowing why, they respond to the mood invoked by the words. In such accidental way, children's taste for lyric poetry may begin." Lyric poetry should be read casually and repeated, and must be read aloud. "Their melodies must be heard if they are to be enjoyed." Examples of lyric poetry: Shakespeare's Under the Greenwood Tree, Coleridge's Kubla Khan, Walter de la Mare's poetry, Blake's Songs of Innocence, Christina Rossetti's Sing Song, Mother Goose. Children enjoy narrative poems that tell a story like The Pied Piper, The Highwayman, or even Little Miss Muffet. They enjoy occasional descriptive nature poems if they're short, such as those by Sara Teasdale or Hilda Conkling. What do children like about poetry? They respond to a poem's singing quality, rhyme, rhythm, meter, onomatopoetic (words that imitate sounds), alliteration (repetition of initial consonants), tone color, cadence, all that goes into the melody of the verse, even though they do not know the technical names. Our business is to savor this singing quality, too, and learn how to bring it out in our reading. Exposure to poetry should begin when children are very small, parents should say it and read it aloud and encourage the child to join in and say it, too. Poems should be read aloud to children all through their first twelve years. By that time, they will have mastered the mechanics of reading for themselves; they will also be steeped in poetry and they will have the habit of saying it so well established that they will go right on reading it and enjoying it by themselves. Children will accept poems read casually and purely for enjoyment more readily than poems that are forced on them as a school exercise. The same poem that may baffle and discourage them when forced on them as a reading assignment will bring delight when read aloud by an adult who understands how to bring out its meaning while making it sing. A child understands it without ever dreaming that it is "hard." What if the parent is unfamiliar with reading poetry? Mother Goose is a good place to start because of its pronounced rhyme and rhythm, giving a sense of tempo and variety. When reading more subtle poetry, use imagination and a delicate precision of interpretation. To acquire this precision, always read a poem aloud and try first of all to get the general mood or feeling. William Blake's "Laughing Song" carries a gentle gaiety, De La Mare's "Someone" is mysterious and hushed, his "Tired Tim" moons and mopes along laggingly, Eleanor Wylie's "Velvet Shoes" should be read slowly and quietly. Before reading a new poem, read it through silently once, merely to familiarize yourself with the words, mood and content. Then say it aloud several times until you get the feel of it and have the characteristic tempo of that particular poem. Children should not be pressured to analyze poems, although they may speculate if they wish. Being forced to sit through long, descriptive nature poems that bore them may permanently ruin their ability to enjoy it. They will not likely appreciate poems written to make adults sentimental about childhood ("Little Boy Blue") or wistful poems about lost youth and regret, or poems whose purpose is to moralize them. Children who have become resistant to poetry may enjoy humorous poems such as Edward Lear and AA Milne. Poetry has the same power of healing that music has. For those who have cultivated a listening ear, poetry has the same therapeutic quality as music. When you and your children have made this discovery, you will appreciate the use of poetry for refreshment, for merriment, for stimulation, and for quiet reassurance. Ruth Beechick's You Can Teach Your Child Successfully includes a section on teaching poetry. Miss Lucy Harrison addressed the meeting on "The Cultivation of Literary Taste in little children." Among the things Miss Harrison had to say, "Early influences are the strongest and most enduring... Poetry...opens up to the mind the secrets of emotion and passion and stimulates all that is best in us. In giving a child the taste for reading we are introducing him to the greatest thoughts of the greatest men and women. The most enduring taste for poetry is learnt in early years.... there should be good substratum of fairy tales. They should have stories in which heroism and romance rouse and stimulate the imagination."